Dennis Rodman is one of the most iconic basketball players of all-time. He was particularly known for his ability to get rebounds and is a seven-time consecutive rebounding champion(1992-1998). He was also a terrific defender and won the Defensive Player of the Year, twice(1990-1991). After getting selected by the Detroit Pistons in 1986, he became their most important player very quickly and helped the Pistons to two NBA titles in 1989 and 1990. Rodman knew his role and always played it to perfection. 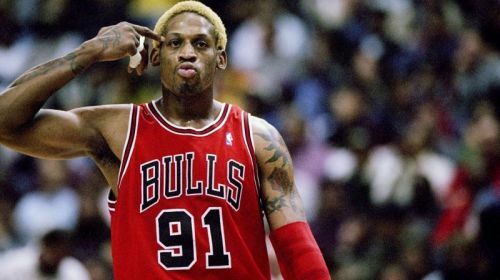 Rodman also won three NBA titles with the Chicago Bulls(1996-98), making him a 5-time NBA champ. He averaged 15.3 rebounds in those three seasons and used his rebounding prowess to help the team. His jersey #10 was retired by the Detroit Pistons and was later inducted into the Hall of Fame in the same year.